Any other Girl Scout moms or troop leaders out there? If you are included in this category, then you know full well why the blog hasn't been hoppin' lately. Girl Scout cookie season just wrapped up last weekend. First of all, I would like to thank all the troop leaders out there (including our troop leader Wendy) and all the cookie directors out there (including our service unit's, Penny) for what they do. These ladies basically give up two months of their time to organize cookie drop offs and cookie booths, and lend entire portions of their houses for storing cookies. 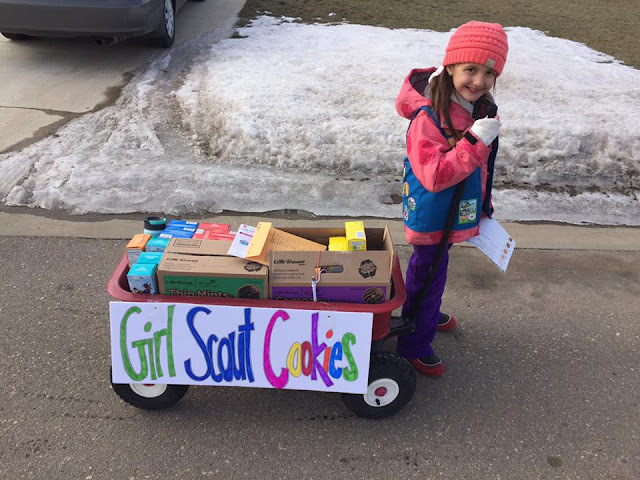 Cookie sales for Girl Scouts do more than just raise money for troops, they also teach girls valuable lessons about goal setting, managing money, running a business and in my daughter's case, teach her how to interact with the community in a professional coherent manner. Her confidence with public speaking improved with basically every door we knocked on. So, one of the staples of cookie season is a cookie booth. If you do one search on Pinterest, you will see some booths that are pretty darn sweet. Kudos to those moms. With the little one and a 100 other things to finish, I don't have time for that. However, I did have time to make an awning for our cookie booth. The plan in my head is every year to do something to add to the booth so we can reuse the pieces year after year. So this year it's an awning and maybe next year it's a durable sign. Maybe we get crazy and the girls can hang some sort of giant cardboard decoration from it. Making this awning is actually really simple and even if you don't have a DIY bone in your body, you can make this is just an hour or so. It's fairly inexpensive and you can reuse it year after year. The supplies I used for this project were PVC pipes, Quikrete (just one bag), two buckets and various connections for the pipes. I also bought some colored duct tape to cover the pipes so they wouldn't be white, but that's completely optional. For the pipes, I bought the lengths I needed so I didn't have to cut anything. If you're willing to cut some pipes, you're probably going to save some money buying longer pieces. I also made mine with several smaller pipes rather than one long pipe, so it would be easy to transport and store. So, the sides are made up of 3- 2 foot long pipes (I used 1 3/4 diameter pipe). The top is one solid piece of 6 foot long pipe. I then bought the various connectors needed to keep everything together. Once I bought everything, I covered everything in duct tape being careful not to tape where the connectors would fit on the pipe (otherwise the pipe wouldn't find inside them). The last step was to dump some Quikrete into a bucket, put one of the side PVC pipes in the bucket and adding some water in. Once you have added the water, take a moment to make sure the PVC pipe is standing straight up and not leaning to one side (you can tape around it to keep it from leaning if you need to) After everything is dried, the awning is ready to go! While we used this for a cookie booth, there are many other possibilities. You could keep with the selling theme and use this for a lemonade stand. Or you could use it to create a stage with a curtain, photo backdrop..really anything that would require you to hang something.